Hello, friends! 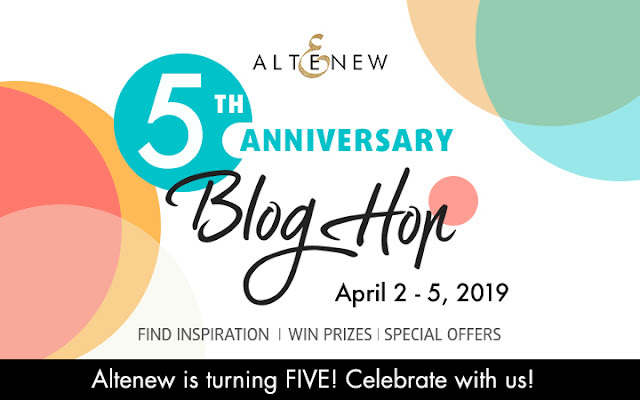 This week Altenew celebrating 5th anniversary with an incredible blog hop! And I’m so honored to be participating in the Altenew’s 5th anniversary blog hop today. You should have arrived from Meghann Andrew, but if not don’t worry there is a hop list at the bottom of my post. Join us today on a fun blog hop celebrating Altenew’s birthday with tons of inspiration and lots of giveaways! To celebrate Altenew's Anniwersary I made an experimental wooden floral background card using Mega Hydrangea Stencil and Wood Pallet Background Stamp Set. First, I covered the white base with a stencil and toned all using Cherry Blossom Mini Cube Set. But I did not remove the mask, and continued to stamp through it, giving the pattern the texture of the tree. I think it turned out great! Wooden hydrangeas, like a picture carved on a tree. To create the composition of the card I used Caps Bold Alphabet Die Set, I cut out the word YOU and slightly tinted the letters at the bottom with Fresh Lemon Crisp Dye Ink. The elegance to the card gave the Fenstone Decorative Element. Your next stop in the hop is Heidi Jakobs. Wow .its a beautiful card ! Lovely card! Thank you for sharing! Sweet color choices on your pretty card! I like your use of the fenstone decorative element and color blending on “you”. What a BOLD and ELEGANT card! Happy 5th Birthday Altenew! The color combo goes so well together especially the yellow on the large word. I love pink and yellow together and I love the message you are sending! Love the Pink and gold! Love the layered stencil and stamp look in the background. Thanks for the inspiration Olga! I love Altenew products! I save and save so I can buy more! I can't have enough! Happy Anniversary Altenew! The background is amazing. Love the background color. Beautiful card. Another fun day on the Blog Hop. Congratulations to Altenew! Nice card - cool idea just stamping through the stencil! Beautiful card and I love the bright pink with the gold. So pretty and elegant. Very striking colors, I love the fadeout yellow on your word against the hot pink, Olga! Happy 5 Altenew! What a cool background you created! Your background is gorgeous, so dynamic. Awesome job. Thanks for sharing your creativity! Very beautiful and elegant card. Thanks for sharing with us on this fun Altenew hop! Love the use of the large alphabet. Such a pretty card! The color is so bold and beautiful! Yes, it did turn out great. Bright colors! Love the background! so inspiring.. love the colors.. Happy 5th Anniversary to Altenew! Congrats!!! Your experiment was a huge success! I love it! Fabulous design, love the color palette! Thanks for sharing all your masterpieces! Happy anniversary to Altenew! Lovely background and card!! Love the yellow to white ombre sentiment against that gorgeous hot pink. This card is a real beauty! Love the way you used the stencil. loving the hot pink color you have used - so delicious!! You are so incredibly talented. Thank you for inspiring me to create. I love the colors on this beautiful card! You are so talented. I scrolled through your last few Altenew posts and love your cards. Gorgeous card. The background is so beautiful -- I love your technique. Amazing bright background! I love how you did the YOU! I would have NEVER thought to put the products you did together but they work SO WELL! Love it!! Oooo!!! Love the pink and gold!!! Beautiful!!! Pretty card, and those letters are stunning! Love how vibrant this card is! Very pretty Olga! I love that bright purple color. Love the bright colors on this card! Very pretty the way this was all layout out. Great job. Thank you so much for sharing today. I love the bold, "in-your-face" color on this card. Well done! Beautiful card, love the Mega Hydrangea + woodgrain! LOVE your card and Altenew!!! Wow-the colors are so brilliant together. Thank you for sharing! Pretty! Pretty! Pretty! Love the boldness! Can't help but ask how you made golden paper design behind the letters?? Its very nice! This is STUNNING!! I love the shading on the letters!! A geat background for the large word. Love the background. Thanks for sharing your idea. Such a pretty card and the colors are striking! Love the vibrant colors. Thanks for sharing and congrats to Altenew! Pretty colors and layering! Thanks for joining in on Altenew's 5th Anniversary blog hop! Very vibrant color choice for your stunning card. Happy 5th Anniversary! Unique project! Thanks for sharing. Striking card. Love the colour combination. Thank you for sharing with us. I just realized pink & yellow look fantastic together. Wow! All I can say is WOW! This card is simply stunning!! Such a vibrantly pretty card! Beautiful card. Thank you for sharing! Great inspiration. Thank you for sharing your techniques, amazing color! So pretty. The gold tipped sentiment is perfect. Such a beautiful card. The contrast of colors works so well. Your card is BEAUTIFUL. 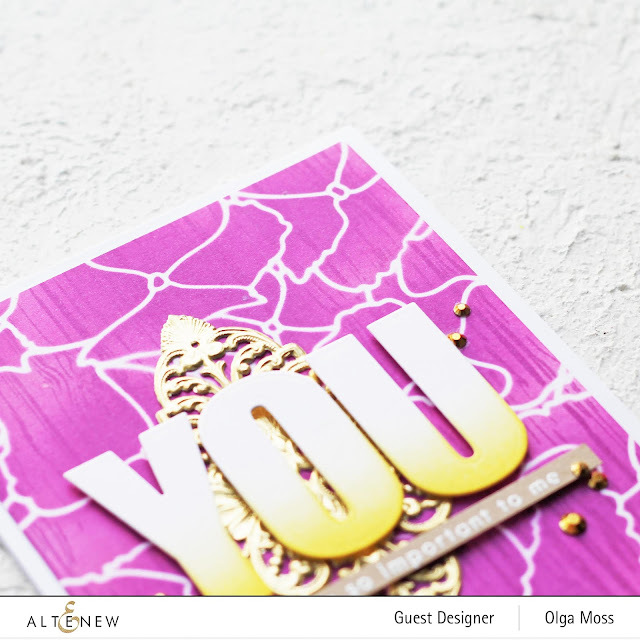 Thankyou for sharing on Altenews 5th Anniversary blog hop celebrations. Beautiful card. I love the colors and the big alphabet letters. bold and beautiful! great work and happy birthday to Altenew! I love the purple background with the stencil and how the yellow on the YOU die looks with it. Such a pretty color! Beautiful background color and I like how you tinted the bottom of the YOU! Beautiful pink background, really stands out, love this design! Congrats Altnew... 5 awesome years!! Amazing card! Job well done! I really like the pinks you used in this card. I love the gold accents on this card. So pretty! 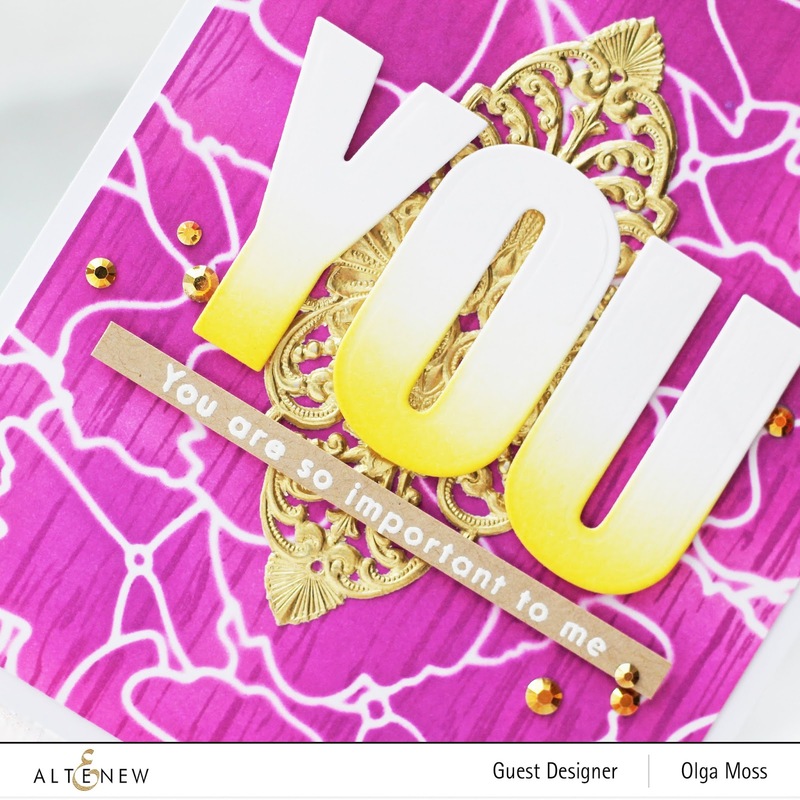 Beautiful card, Olga! Love that bright pink background with the gold accents! I love the bold background color!! So pretty! Nice shade of purple! Love it with the gold elements and the big die-cut letters with the soft sponging! So, so pretty! Happy Anniversary to Altanew! Beautiful card, great colourcombination; a real eye-catcher. Thanks you for sharing your project ! Awesome card, I love the way you made the background. That background is incredible. So talented! 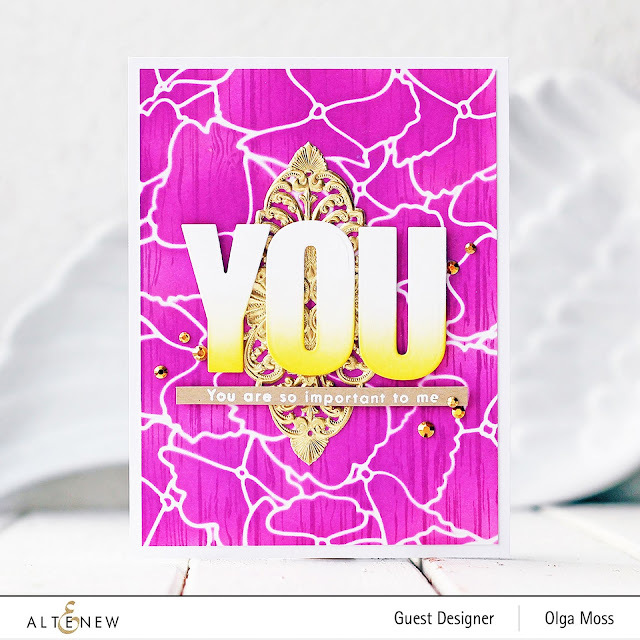 Love the bold pink with the gold and pop of yellow on your pretty card! A super cool background! I love that bright color! Wonderful card, love the background especially. Fabulous card! Love your colors and wonderful style. 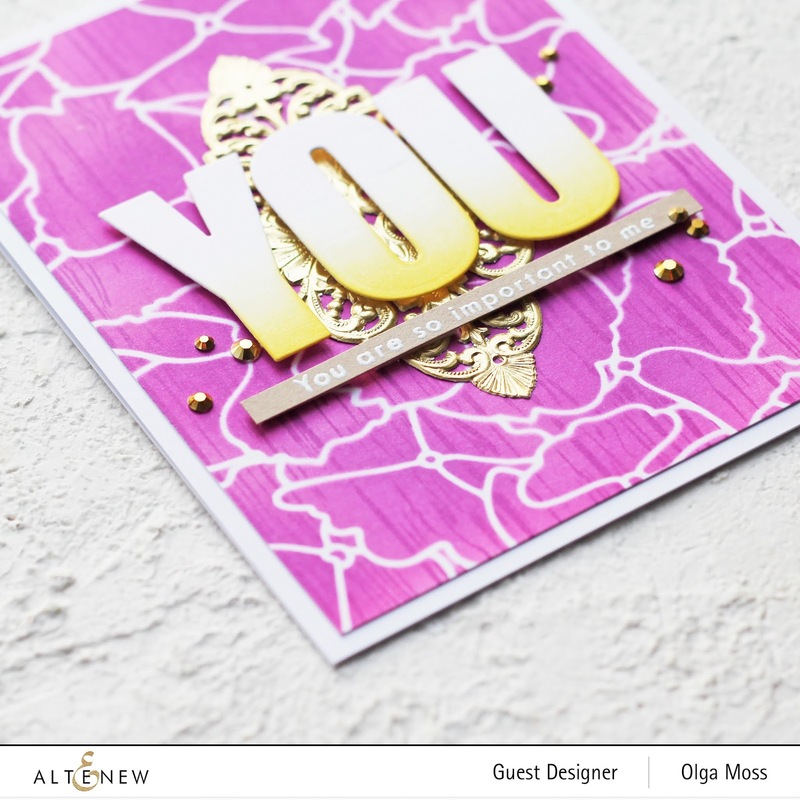 LOVE your BOLD and BEAUTIFUL card, the background is GORGEOUS and contrasts PERFECTLY with the ombre YOU and golden decorative element! Great card - I usually don't love pink, but that bold, patterned pink background looks fabulous with the focal. Beautiful card and technique. I've never tried that! Thanks for the inspiration! How creative! The colors are so vibrant and the mix of elements on your card give it some really interesting texture. I do like that wood panel stamp in the background. Very nice card! Such a stunner! !thanks for sharing!! Stunning piece of art! Turned out so beautiful! What a great idea to ink blend then stamp over it. The tone-on-tone especially works for the woodgrain. I don't think I would have tried that with pink, but this looks great! Thanks for sharing. Beautiful! Love the gorgeous background and the bold colours. Congrats to Altenew on turning 5! I have loved their designs right from the first release. Wishing them many more years of fabulous success! Love that background!!! So cool! Beautiful!! Great technique on the background with the stencil and stamp; it creates a really unique look! And I love the "you" with just a bit of yellow on the bottom; very fun! How bright and brilliant!! I love this beautiful bold card!! Excellent work!! Such a bright and beautiful card!! So pretty! Love the bright color! Fantastic card! I love the bright pink! such a bright happy card!! Love the card, so elegant. I could see me giving this card to my mom. Thanks for sharing and Happy Anniversary Altenew! Love,love all the details that you put into your gorgeous card. Thank you for posting.